Thirty miles outside Washington, DC is Fort Belvoir, Virginia. Originally, the land was the site of the Belvoir plantation purchased by Lord William Fairfax in 1738 where he built an elegant brick mansion (Destroyed by fire in 1783, the ruins of the Belvoir Mansion and the nearby Fairfax family grave site are listed on the National Register of Historic Places). 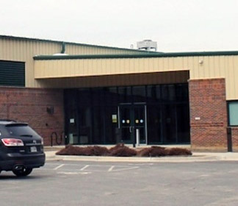 Sometime later the land was acquired by the U.S. government and during World War I became the home of the Army Engineer School prior to its relocation in the 1980s to Fort Leonard Wood, in Missouri. Today, Fort Belvoir is home to a number of important United States military organizations including the U.S. Army’s Center of Military History. The building itself is very nondescript but behind a series of highly alarmed doors and long, cement, camera-laden hallways is the highly sophisticated, climate-controlled treasure room where the army keeps its most precious artifacts. Behind these giant doors lay the army’s historic collection of weaponry. The room consists of dozens of collapsible “hallways” filled with the richest American firearm collection on the planet. The collection is stacked with priceless items. 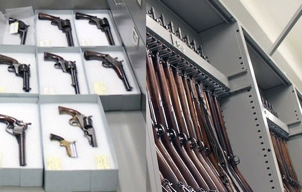 Entire lineages of weapons are kept here for research as well as preservation purposes. Another portion of the warehouse consists of endless rows of gigantic, airtight lockers. Every meaningful artifact that has been worn on a military battlefield is stored here, including Gen. Ulysses Grant’s Civil War cap. Famous generals’ uniforms and Revolutionary War powder satchels, flags, canteens and cannons. And the rows go on and on and on and on. 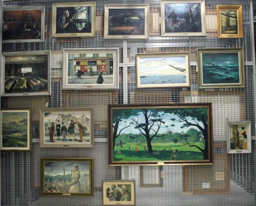 But the crown jewel of the collection is the 16,000 pieces of fine art the army owns. The art is kept on giant rolling metal frames. The massive collection consists of donated and commissioned pieces. Much of the art was painted by soldiers who experienced their subjects in real life. During World War I, the army began commissioning artists to deploy into the war zone and paint the scenes they observed. This practice has continued to this day. Much of the museum’s collection consists of these commissioned wartime pieces. The collection also keeps hold of valuable donated military art and historical pieces dating back to the Mexican American War. The art tells the story of America’s wars through a soldier’s unique perspective. Some works are just beautiful beyond words. 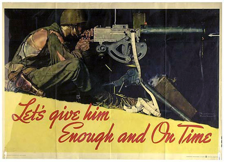 Every aspect of war is captured in the collection which includes original army propaganda art, including beautiful Norman Rockwell originals that the Army commissioned in the 1940s. Virtually every American conflict is represented from a first-hand soldier’s perspective: Peace and War as well as humanitarian aid missions. The collection also has a controversial side that has never been displayed. Unique art and artifacts that were seized from the Nazis after World War II are stored here. A number of Hitler’s paintings were seized by the U.S. Army at the end of World War II and found a home at the center. Not a single piece in this massive collection is open to the public because there is no museum to house it. The entire collection could be made accessible to the public, if the funds for a museum could be raised. The Army Historical Foundation is in charge of raising the funds for the museum. 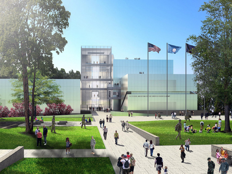 The foundation’s president recently told the Washington Post that they have raised $76 million of the $175 million required for the museum and predicts the museum could open in 2018. It is also to be located at Fort Belvoir, six miles west of Mount Vernon.